This large 700 square foot rental unit called the 'Coconut Corner' is one of the nicest rentals you will find on the Windward side of Oahu — a king size bed, full split A/C in every room and HD TV's in both the bedroom and the living room, a fully upgraded kitchen with solid surface countertops, custom cabinetry, stainless steel fridge, range/oven, mircohood & dishwasher plus a covered patio with a table and chairs with ceiling fans throughout the rental, free parking right out front along with free laundry and WiFi—and it's all offered at a wonderfully affordable price. 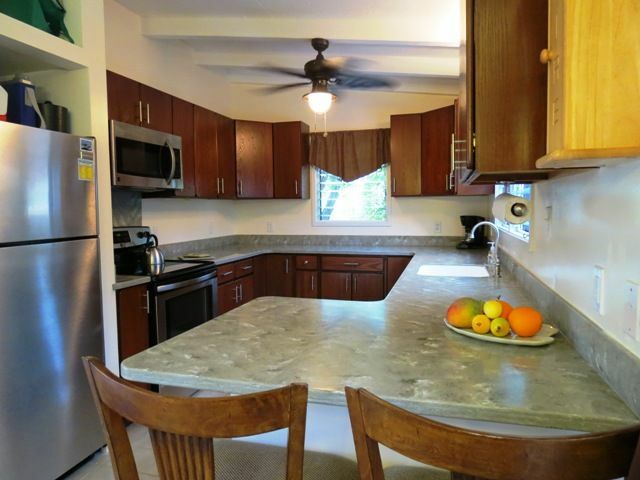 This large vacation rental is in a quiet residential neighborhood just a half-mile from the access to a beautiful sandy stretch of Kailua Beach. It is close to Kailua Town and the neighborhood Aikahi Park Shopping Center with restaurants, hair/nail, liquor/poke store, coffee shop, bank, gas station and a grocery store all within walking distance. Kailua is a friendly town of about 38,000 located on the beautiful northeast shore of Oahu. I love Kailua for its many beaches and accessible off-shore islands. The beautiful two-mile stretch of sparkling Kailua Beach and adjoining Lanikai have been rated tops among America’s best beaches. Surf shorebreak, kayak, swim with the green sea turtles, or sail to one of the secluded offshore islands and maybe spot the whales breech offshore. It does not get any better than this! It is only a 25-minute scenic drive to the airport, Honolulu, and Waikiki. Nearby sites include Kailua Beach Park, Kailua Farmers Market, Lanikai Pillbox hike, Maunawili Falls, Sea Life Park, Sandy Beach, Waimanalo, Hanauma Bay, and the North Shore. Kailua town offers many diverse restaurants and shopping locations. There are businesses that offer kayaks, kite surfing, and wind surfing lessons and rentals. There are wonderful hiking trails nearby and waterfalls. Kailua offers a completely different atmosphere from the hustle and bustle of Waikiki. Many of our guests enjoy the laid back atmosphere, sense of community, and Aloha Spirit we all share. Also, enjoy making your own meals in the full kitchen, even firing up the stainless gas grill to cook up some special dinners. This rental is smoke free and we ask that our smoking guests smoke outside only. Aloha, I'm a husband, father, jack of all trades, coach of all sports and owner/manager of 5 vacation rentals in Hawaii. I was raised in Hawaii from the age of 8 years old after my family moved here from the USA mainland. Hawaii has so much to offer and I hope you get the chance to visit and explore this incredible island. My wife and I grew up in Kailua so we know it well. It's so close to the beach, restaurants and grocery stores. The small town feeling and tight community remind us of our younger growing up days. It was so great that we were able to own a home in the beautiful town that we grew up in. The beach is beautiful with it's white sand, friendly people and mostly calm waters. Never really rough, even in the winter when the North Shore surf spots are reaching 25 feet - Kailua bay will stay nice and mellow. A perfect beach for swimming and boogie boarding. There is a small covered patio on the corner, next to the coconut trees, for meals or just for enjoying that morning coffee while watching joggers and dog walker going by. The sliding pocket doors separate the bathroom from the rest of the rental and separate the toilet/tub/shower area from the bathroom sink/mirror area. Access to the famous Kailua Beach is only a 10-minute walk away. Sometimes at night, you can hear the waves crashing onto the shore. Although there is the Aikahi Park Shopping Center only a 10-minute walk away...Kailua Town is a 5-minute car ride away. It's in a quiet residential neighborhood, on a quiet road with mountain views. Split A/C....one wall unit in the bedroom and a bigger wall unit in the open concept living/dining/kitchen room so the entire rental is climate controlled. Front loader, Laundry detergent is provided. There is free off street parking right in front of the rental. Beach chairs, Boogie Boards, Beach Umbrella, Coolers, Charcoal Grill, Beach Bags and some snorkeling gear are all in the garage. Beach & Bath Towels are provided. There is a yard area off of the covered patio. There are bikes you can use. Boogie boards, sand toys, coolers, beach chairs & umbrella, beach towels, beach grill and some snorkeling gear are available. No court but racquets are available. Not on a golf course but a set of clubs is available. Very nicely furnished, air conditioned throughout, large rental unit with a HD TV, DVD with a convertible full-size futon couch in the open layout living/dining/kitchen, a 2nd HD TV and king bed in the bedroom, Ceiling fans and cool tradewinds throughout. Coffee Maker, Toaster Oven, Blender, Coolers, Books, Beach: Towels, Toys, Umbrella, Chairs, Snorkeling Stuff, Boogie Boards and a covered outside patio with table and chairs. Lovely one bedroom apartment with all the amenities needed! This is a great place to stay for one person, two people or a family with small children. The kitchen is fabulous! Lots of counter space, a microwave, dishwasher, stove and oven, refrigerator and freezer with an ice maker. The living room dining area is very comfortable and has an air conditioning unit as well as cross ventilation and a ceiling fan. The bedroom also has an air conditioning unit and a ceiling fan as well. Both the living room and bedroom have TV's connected to Spectrum cable. The bathroom has a tub and shower and the sink is in a separate area! There is a high speed wi-fi, a BBQ grill, & everything you need for the beach. You can use the washer and dryer which is in the garage! There's a small porch with a table and chairs as well. The owners are delightful and helpful and live in the attached home! I highly recommend this to anyone wanting a great place in Kailua! We enjoyed staying here. The unit is very comfortable with some lovely touches - great kitchen and bedroom, comfortable recliners in the living room, well stocked, nice neighbourhood, easy parking. And it actually has a bathtub as well as shower - not all that common. Greg and Cindy were easy to communicate with. Kailua is a good base for lots on the island, and has a super beach. We recommend. Enjoyed all the amenities of this quiet corner unit with its lovely new kitchen and beautiful plank flooring. Fairly close to the beaches and shops and restaurants in town and well equipped with cooler, beach chairs etc. Living room furniture could use some updating though as we found the couches a bit uncomfortable. Air conditioning was greatly appreciated as we were there during some stormy, humid weather. While Greg was a gracious and accommodating host the unit needs a redo. The furniture was kind of shabby and the place needs to be upscaled. The mattress was too soft for us but that’s a personal preference. The bedroom light had no wall switch but was worked from a string hanging over the middle of the bed which was difficult to do when in bed. Overall, it was just adequate. Ouch - that shabby comment stings. I really don't want to sound defensive - I realize people have vastly different tastes in decor. But I just want to point out that quite a significant amount has been invested in this rental recently to completely re-do the kitchen, the flooring is new, the split air conditioning is new and after putting in AC, we needed to upgrade all the windows to hold that nice cold air in. And then after new windows - we had to have the house painted, of course. I'm not sure what kind of upscale amenities you might have missed or been looking for, but I do realize a vacation rental is a different experience from staying at a luxury hotel. This is a nice rental. It was clean. The kitchen was well equipped. The bed was comfortable. Nice quiet neighborhood on the west end of Kailua. Nice attached unit with room for family to visit. A little farther from the beach than we thought, but will probably stay there again. Owners on site and friendly and helpful. Kailua beach, a shopping center and The Bus stop are within walking distance. Also nearby: Skate Park, Indoor Basketball/Volleyball, Large Public Pool, Shopping Center, Ocean Sports Rentals and a Hospital. Less than an hour away is Hawaiian Adventure Water Park, Honolulu Zoo, Pearl Harbor, Polynesian Cultural Center, Ala Moana Shopping Center, Swap Meet and several Museums. Free parking right outside. Cancellation Policy-A full refund is given(less a $250 cancellation fee and the VRBO fees)if cancelled with more than 60 days before check-in. If cancelled with 60 days or less before check-in, a refund(less a $250 cancellation fee and the VRBO fees)is only given for those days I can re-book with other guests. Any changes to an existing reservation is subject to a $50 change fee (i.e changing to fewer dates, changing to less guests, adding a pet, etc. ).